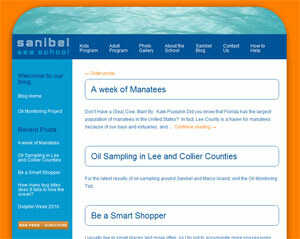 We recently completed a custom blog design for Sanibel Sea School. Their old blog was a WordPress.com hosted blog, and we recommended that they bring it over to their main website to host it there. This helps a lot with search engine optimization, and is generally a better idea to keep your users on your website. We are also currently completing an online classroom website for them and are excited to see that launch very soon also.